These pancakes are not bad. My testers paid them the supreme compliment and said they tasted like "regular" food. I found the recipe in the Taste of Home Healthy Cooking 2009 Annual Recipes collection. I made the recipe just as it was written, although I toasted the almonds before grinding and omitted the chocolate chips. I'd make these again. 1) In a large bowl, combine the rice flour, potato starch, almonds, sugar, baking powder and salt. 2) In another bowl, whisk the eggs, milk, butter and vanilla. 3) Add liquid into dry ingredients, stirring just until moistened. Fold in optional chocolate chips if desired. 4) Pour batter by 1/4 cupfuls onto a hot griddle coated with cooking spray; turn when bubbles form on top. Cook until the second side is golden brown. Yield: 12 pancakes. I can tell this recipe would work really well for gluten free baking. Beautiful picture too. I'll pass your link on to those who need it. Thanks for such lovely inspiration. These look delicious and Happy Easter! Gosh Mary. I've used easter as an excuse to have a break from posting, unlike you. Very handy pancake recipe this one however I must say your savoury roast potatoes look like a real winner. These look delicious. I have never tried gluten free ones, but they sound marvelous! Those potatoes though, holy lord , they are a work of culinary art! My Aunt has celiac disease so I am sending this recipe her way. I have these ingredients in pantry, maybe I will try it this Sunday. THe sound a lot healthier than mine usual ones for the kids. Sorry if this is a stupid question, but how do you grind the almonds? Or can you find them already ground? I do actually need to buy some more gadgets, so if you have a particular product that you recommend, I would appreciate it! Dunn, first order of the day is to welcome you to my place. I hope you'll come often. You can but almond ground. It's a great time saver. You can also use a blender or small food processor. Ground almonds resemble fine cornmeal. I made these over the weekend. They turned out to be some of the best GF pancakes I've ever made. In the past, what I make tends to be gooey in the middle, but these were really good. Thanks! 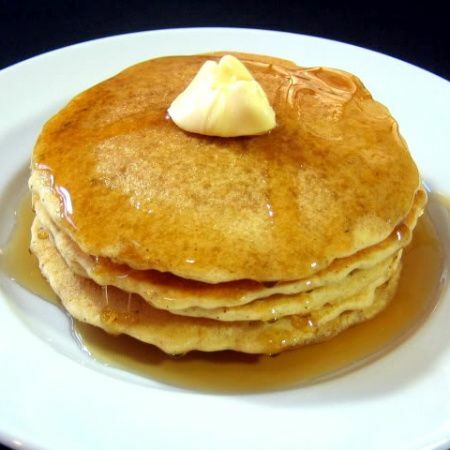 I've always wanted to try pancake recipes but always have some difficulty because I don't exactly have a griddle. Would a non-stick frying pan work? Just made these. They were a huge hit. My son said "these taste like ice cream!" My wife said these were the best she's ever had, even compared with regular wheat flour. We'll make them all the time now. Thank you!